© 2019 Muslim et al. Fusarium Oxysporum f.sp. Radicis-Lycopersici (FORL) caused Fusarium Crown and Root Rot of tomato (FCRR), it’s a serious constraint on tomato production and contributing to yield losses. Using a rapid bioassay, Hypovirulent Binucleate Rhizoctonia (HBNR) was tested for their ability to reduce Fusarium Crown and Root Rot (FCRR) of tomato, caused by Fusarium oxysporum f.sp. radicis lycopersici (FORL). Roots of tomato seedlings growing on 2% water agar in plastic boxes were inoculated with living or dead mycelial disks of HBNR. After 24 h, the pathogen was applied at 0, 3, 6, and 9 cm away from the position of the HBNR. When living HBNR was used, the treatments provided significant protection to tomato seedlings from FCRR infection at all distances tested. Tomato plants pre-inoculated with living HBNR at different times (12 h and 24 h before inoculation with the pathogen) and challenged with FORL showed significant reduction of FCRR lesion development. A significant reduction was still observed even when HBNR was inoculated simultaneously with or 12 h after inoculation of a pathogen. Seedlings treated with dead HBNR and culture filtrates also showed significantly reduced FCRR lesion development. When living HBNR were enveloped by a polycarbonate membrane filter, a significant reduction of FCRR lesion development was still observed. 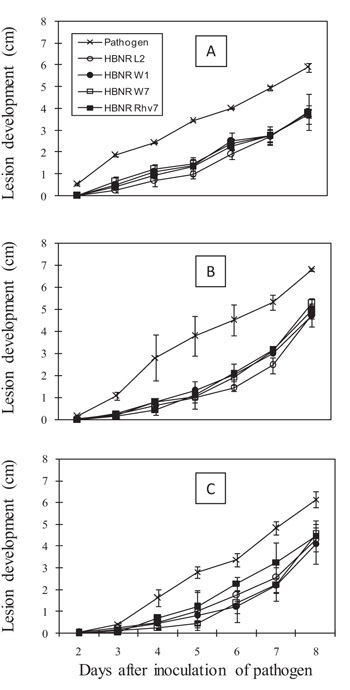 In all experiments, reduction of FCRR lesion development in seedlings treated with HBNR tended to decrease with longer distance from the inoculation point of FORL and HBNR. We developed a simple, rapid, and miniaturized bioassay for evaluating the efficacy of HBNR against FORL. The bioassays require only 12 - 18 days, which is at least 12 days less than the soil system employed by previous researchers. Keywords: Non-pathogenic Rhizoctonia, Fusarium oxysporum f.sp. radicis-lycopersici, Rapid biocontrol assay, FCRR, HBNR, Bioassays. Fusarium Crown and Root Rot of tomato (FCRR), caused by Fusarium Oxysporum f.sp. Radicis-Lycopersici (FORL), is a serious constraint on tomato production that limits the yield of greenhouse- and field-grown tomato crops . The disease was first detected in Japan in 1974 . Yield losses caused by FCRR in greenhouse and field tomato production range from 15 to 65% . Recent research on the management of Fusarium wilt and FCRR has focused on diverse strategies, either individually or in combination. These strategies include host resistance and chemical, biological, and physical control . Vitale et al. demonstrated that grafting tomato hybrid plants onto “Natalia” rootstock significantly enhanced the tolerance of plants to FORL, even though proteomic analysis showed a higher representation of proteins associated with pathogen infection. A combination of a plant-growth-promoting strain of Fusarium equiseti with biodegradable pots was also an effective control of FCRR . Hypovirulent Binucleate Rhizoctonia (HBNR) were investigated as effective biocontrol agents for a number of important diseases caused by Rhizoctonia solani  and Phytium . Our previous research showed that HBNR effectively controls Fusarium wilt of tomato , Fusarium wilt of spinach , and Fusarium crown and root rot of tomato . These studies indicated that one of the mechanisms of biocontrol of fusarium diseases with HBNR isolates might be induced resistance. Investigations of HBNR as an agent of Induced Systemic Resistance (ISR) in beans, against the root rot pathogen Rhizoctonia solani or the anthracnose pathogen C. lindermuthianum, have also been reported . HBNR also effectively protected cotton seedlings against rhizoctonia damping-off and Alternaria leaf spot with a mechanism of Induced Systemic Resistance (ISR) . A major limiting factor in the development of biological control strategies for different plant diseases is the formulation of efficient procedures for rapidly screening large numbers of organisms for biological control activity. While field screening should theoretically provide the best detection of efficient biocontrol strains, limitations of space, labor, cost, and optimal environmental conditions preclude the use of this type of screening strategy. Laboratory assays based on the in vitro inhibition of pathogens or production of particular metabolites by biological control agents offer a rapid and relatively inexpensive means of screening organisms but may not be good indicators of biocontrol potential. Unsurprisingly, biocontrol strains selected in vitro on the basis of phenotypes with unknown links to biological control activity in plant systems do not always perform as expected under greenhouse or field conditions [14, 15]. The present study was undertaken to: (1) develop a rapid and miniaturized laboratory bioassay for screening the efficacy of HBNR in reducing FCRR in the tomato; (2) investigate the efficacy of various inoculum forms (living and dead mycelial disks) of HBNR in controlling FCRR using a water agar system. Organisms: Four isolates of HBNR were used as biocontrol agents: L2 (AG-Ba), W1, W7 (AG-A), and HBNR Rhv7 (unknown anastomosis group). Fusarium Oxysporum f.sp. Radicis-Lycopersici (FORL) isolate RJNI, obtained from a tomato infested with Fusarium Crown and Root Rot (FCRR), was used as the inoculum of the pathogen. Plant: Tomato cv. “House Momotaro”, a popular cultivar that is susceptible to FCRR, was used throughout the experiments. Inoculum preparation: (1) The pathogen, FORL, was grown on Potato Dextrose Agar (PDA) for 7 days in the dark at 25oC. Spores were scraped from the cultures with a sterile glass bar, and a spore suspension was prepared in sterile water and filtered through eight layers of sterile gauze. (2) HBNR isolates were prepared as inoculum forms in Potato Dextrose Agar (PDA) plugs (living and dead mycelial disks). The isolates were grown on PDA for 3-7 days in the dark at 25 oC. The dead mycelial disk was prepared by killing the 7-day-old culture with chloroform and then drying it for 60 min on a clean bench. To make Culture Filtrate (CF), two mycelial disks of each HBNR isolate, obtained from the growing margin of a colony on PDA, were transferred to a 200-ml flask containing 50 ml of potato dextrose broth (pH 6.5). The isolates were cultured without shaking for 10 days in dark. The crude culture filtrate was separated from mycelia and filtered three times through three layers (each time) of Whatman no. 2 filter paper. The CF was then filter sterilized (0.45-μm Millipore filters, Millipore Products Division, Bedford, USA). The efficacy of HBNR in suppressing the development of FCRR in the tomato was tested in laboratory experiments using a Water Agar (WA) system method (Fig. 1). Tomato seeds were surface-sterilized in 70% ethyl alcohol for 1 min followed by soaking in 1% sodium hypochlorite with 3 drops of Tween 20 (polyoxyethylene sorbitan monolaureate; Nacalai Tesque, Inc., Kyoto, Japan) for 20 min. The seeds were then rinsed three times with Sterilized Distilled Water (SDW). The seeds were pre-germinated on 2 layers of Whatman No. 1 filter paper for 3 days in the dark at 25oC. Five seedlings were transferred to a sterilized plastic box (196 × 104.5 × 28 mm) containing Water Agar (WA) and allowed to grow for 6 days at about 20 in a cleanroom. A living HBNR mycelial disk (3-mm diameter, taken from the advancing margin of a three-day-old culture), a dead mycelial disk (7-mm diameter), and CF (70 µl) were used to inoculate the basal hypocotyls of the seedlings, which were again incubated for 24h. To prevent, spread and maintain a uniform distribution of CF on basal hypocotyls or roots, drops of CF were placed on an 8-mm diameter paper disc with 1.5-mm thickness (Advantec, Toyo Roshi Kaisha, Ltd. Japan). To avoid direct contact between HBNR and FORL, the mycelial disk of HBNR was enveloped by a polycarbonate membrane filter (0.2-µm mesh). An additional experiment using a living mycelial disk (3-mm diameter) without an enveloping membrane was also done. In this experiment, the inoculation period of the HBNR varied from 0 h to 12 h after inoculation with the pathogen and 0 h to 24 h prior to inoculation with the pathogen. As a control, seedlings were inoculated with HBNR-free PDA or SDW. Then, 5 µl of pathogen suspension (5 × 105 spores/ml) were inoculated at positions 0, 3, 6, and 9 cm away from the position of the HBNR inoculum. A 5-mm diameter disk of lens paper was placed on each drop to prevent runoff and to maintain a uniform distribution of spores on the root surface. The treatments were prepared in four replicates. Treated and control seedlings were maintained at about 20oC for another 2-8 days. Disease severity was determined by measuring lesion development at the pathogen inoculation point. Percent reduction of lesion development was used to measure the efficacy of HBNR against the pathogen, by employing the formula [(A-B)/A] × 100, in which A represents the lesion length observed on the root due to inoculation of pathogen alone and B is the lesion length observed on the root due to co-inoculation of HBNR and the pathogen. The experiments were carried out in a completely randomized design. Treatment means obtained for lesion development of FCRR were compared using Fisher’s Least Significant Difference (LSD) test with critical values of P = 0.05. In a WA system, tomato seedlings treated with living mycelia, dead mycelia, and CF of HBNR isolates significantly reduced lesion development of FCRR (P = 0.05). When living mycelia were used as treatment, seedlings treated with HBNR isolates had significantly less FCRR lesion development after 4-8 days of pathogen inoculation (Fig. 2). The percentage of reduction tends to decrease with the longer distance between HBNR and FORL. At a distance of 0 cm between HBNR and FORL, the reduction of lesion development by HBNR L2, W1, W7, and Rhv7 was almost completely ranged from 88-98%. At a distance of 3 cm, application of all HBNR still highly reduced lesion development by 88-96%. At a distance of 6 cm and 9 cm, the reduction of lesion development by all HBNR isolates slightly decreased by 55-94% and 11-66%, respectively (Fig. 2). Tomato seedlings treated with dead mycelia of all HBNR isolates except L2 also showed significant reduction of FCRR lesion development 2-8 days after inoculation with the pathogen (Fig. 3). At a distance of 0 cm, lesion development reduction was 6-21%, 22-79%, 9-49%, and 4-52%, for HBNR L2, W1, W7, and Rhv7, respectively (Fig. 3A). At a distance of 3 cm, the reduction of lesion development by HBNR L2, W1, W7, and Rhv7 was 5-37%, 16-52%, 10-41%, and 9-59%, respectively (Fig. 3B). At a distance of 6 cm, lesion development reduction was 2-34%, 15-45%, 10-49%, and 4-48%, respectively (Fig. 3C). The application of CF of HBNR isolates also resulted in significant reduction in FCRR lesion development 2-8 days after pathogen inoculation (P = 0.05; Fig. 4). At a distance of 0 cm, the reduction of lesion development by HBNR L2, W1, W7, and Rhv7 was 35-85%, 36-73%, 37-64%, and 36-78%, respectively (Fig. 4A). At a distance of 3 cm, treatment with HBNR L2, W1, W7, and Rhv7 reduced lesion development by 30-79%, 31-83%, 23-74%, and 27-88%, respectively (Fig. 4B). At a distance of 6 cm, the reduction of lesion development by HBNR L2, W1, W7, and Rhv7 was 30-70%, 33-72%, 26-84%, and 27-86%, respectively (Fig. 4C). We attempted to prevent direct contact between HBNR and FORL by enveloping the living mycelia in a polycarbonate membrane filter (0.2-μm mesh), but the mycelia still penetrated the membrane, so that direct contact between HBNR and FORL was observed. 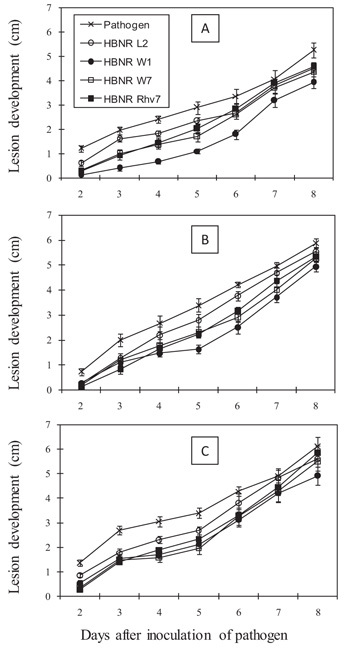 In this experiment, a significant reduction in FCRR lesion development was still observed up to 8 days after pathogen inoculation at a distance of 0 cm (P = 0.05; Fig. 5A). At a distance of 3 cm, a significant reduction in FCRR lesion development was observed until 6 days after pathogen inoculation (P = 0.05; Fig. 5B). However, at a distance of 6 cm, a significant reduction was only observed at 3-4 days after pathogen inoculation (Fig. 5C). The reduction of lesion development by HBNR W1 was 25-78%, 13-67%, and 10-52% at distances of 0, 3, and 6 cm, respectively. Fig. (1). 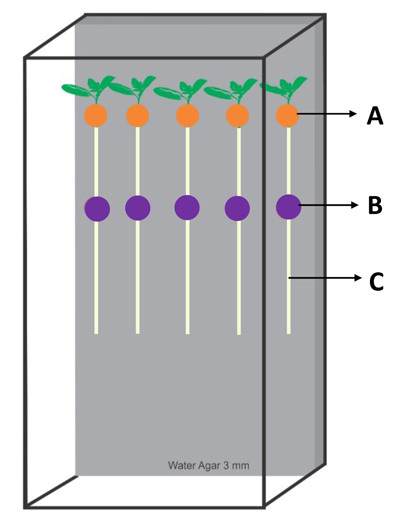 Diagram of laboratory assay of Hypovirulent Binucleate Rhizoctonia (HBNR) to suppress the disease development of Fusarium Crown and Root Rot (FCRR) of tomato and to induce resistance against the disease, using the water agar method. (A) Inoculation point of HBNR consisting of a living mycelial disk (3-mm diameter), a dead mycelial disk (7-mm diameter), and CF (70 µl). In order to avoid direct contact between HBNR and FORL, the mycelial disk of living cells was enveloped by a polycarbonate membrane filter (0.2-µm mesh); (B) Inoculation point of Fusarium oxysporum f.sp. Radicis-Lycopersici (FORL) with spore suspension (5 µl of pathogen suspension at 5 × 105 spores/ml) at 0, 3, 6, and 9 cm away from the position of HBNR inoculum (separate experiment for each position); (C) Tomato root. In another experiment, pre-inoculation at 12 h and 24 h with living mycelia of HBNR W1 or Rhv7 on the seedlings, and challenge-inoculation with FORL at 3 cm and 6 cm away from HBNR, also resulted in significant reduction in lesion development compared to the control, after 8 days of pathogen inoculation (Table 1). At 12 h pre-inoculation of HBNR, at a distance of 3 cm, treatment with HBNR W1 and Rhv7 reduced FCRR lesion development by 90% and 91%, respectively. At a distance of 6 cm, the reduction by HBNR W1 and Rhv7 was 71% for both. The reduction slightly increased with the longer pre-inoculation period of 24 h. At a distance of 3 cm, the reduction by HBNR W1 and Rhv7 was 93% and 90%, respectively. At a distance of 6 cm, the reduction by HBNR W1 and Rhv7 was 82% and 74%, respectively. 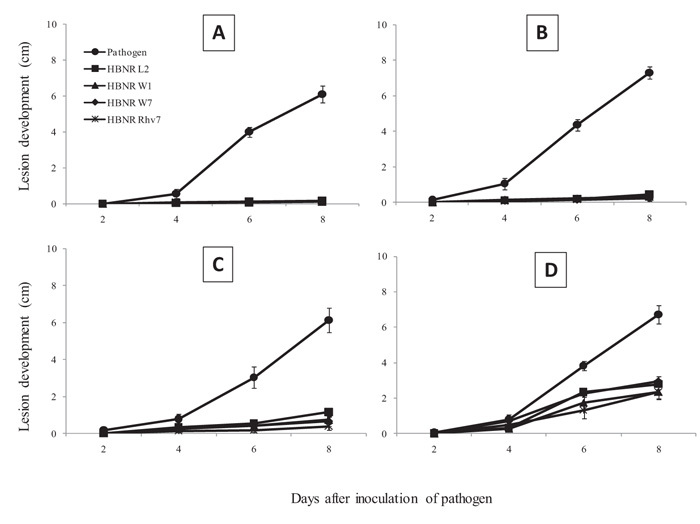 HBNR isolates also significantly reduced lesion development of FCRR (P = 0.01) when both isolates were applied simultaneously (0 h) and even when HBNR was applied 12 h after pathogen inoculation. At 0 h or simultaneous inoculation, at a distance of 3 cm, the reduction of lesion development by HBNR W1 and Rhv7 was 89% and 90%, respectively. At a distance of 6 cm, the reduction was 71% and 64% for HBNR W1 and Rhv7, respectively. At 12 h after pathogen inoculation, at a distance of 3 cm, the reduction was 89% and 81% for HBNR W1 and Rhv7, respectively. At a distance of 6 cm, the reduction by HBNR W1 and Rhv7 was 66% and 59%, respectively. Table 1. Effect of Hypovirulent Binucleate Rhizoctonia (HBNR) with various pre-incubation times on the reduction of lesion development of Fusarium Crown and Root Rot (FCRR) of tomato caused by Fusarium Oxysporum f.sp. Radicis Lycopersici (FORL) in water agar a.
a Eight-day-old tomato seedlings were grown in 2% water agar treated with HBNR and challenge-inoculated with FORL. b Lesion development was recorded 8 days after inoculation with FORL. c Inoculation points of FORL were 3 cm and 6 cm away from HBNR position. d Pre-incubation of HBNR on neck root: 12 h after inoculation of pathogen (-12); simultaneous inoculation of HBNR and pathogen (0 h); 12 h before inoculation of pathogen (12); 24 h before inoculation of pathogen (24). e Mean of four replications with five seedlings per replication. Values followed by the same letter do not differ significantly (P > 0.05) according to Fisher’s least significant difference test. Fig. (2). Effect of living mycelia of HBNR isolates on lesion development of Fusarium crown and root rot of tomato, after being challenge-inoculated with FORL at 0 cm (A), 3 cm (B), 6 cm (C), and 9 cm (D) away from the position of HBNR inoculum. Data are means ± SEM of 4 replications with 5 seedlings per replication. Fig. (3). Effect of dead mycelia of HBNR isolates on lesion development of Fusarium crown and root rot of tomato, after being challenge-inoculated with FORL at 0 cm (A), 3 cm (B), and 6 cm (C) away from the position of HBNR inoculum. Data are means ± SEM of 4 replications with 5 seedlings per replication. In this study, all HBNR isolates tested using various inoculum forms, i.e. living mycelia, CF, and dead mycelia significantly reduced lesion development of FCRR. Maximum protection occurred when the pathogen was inoculated at the position of 0 and 3 cm away. However, protection decreased at a distance of 6 and 9 cm. In our study using the WA system method, the phenomena lesion development affected by biological control agents could be rapidly recorded without destructive to the root system. Living mycelia showed a stronger inhibition of lesion development throughout the experiment, while dead mycelium inhibited effectively lesion development up to 5 days then decrease at a longer time of incubation. It might be that on living mycelia, three were a competition in infection site between HBNR and FORL. HBNR has been reported to be an effective colonization of plant root [11, 16] and it was likely that inoculated living HBNR mycelia had been already colonizing the infection site that allows competition between HBNR and FORL. Pre-inoculation of living mycelia of HBNR at a different time, and challenged with FORL, resulted in significant reduction in FCRR lesion development, even when HBNR was inoculated simultaneously (0 h) or 12 h after inoculation of the pathogen. Tomato seedlings treated with CF and dead mycelia of HBNR effectively reduced FCRR lesion development. The in vitro interaction experiments using living or dead mycelia and CF reveal that they did not produce any zone of inhibition (data not shown), suggesting that they were not antagonistic and ruling out the possible involvement of toxins or antifungal compounds in disease suppression. Since CF and dead mycelia of HBNR application sites and pathogen application sites were spatially separated by a distance of 3-6 cm, and there was no contact between HBNR isolates and the pathogen until day 5 at 3 cm and day 8 at 6 cm, we observed that average mycelial growth of the pathogen was 0.54 cm/day. Induced resistance in tomato plants by HBNR may be one of the mechanisms of biological control against FCRR in this study. These results confirm those of  and , who reported that HBNR did not inhibit or parasitize R. solani. Plant protection by hypovirulent binucleate Rhizoctonia involves resistance pathways such as Systemic Acquired Resistance (SAR), Induced Systemic Resistance (ISR), and phytoalexins . Fig. (4). 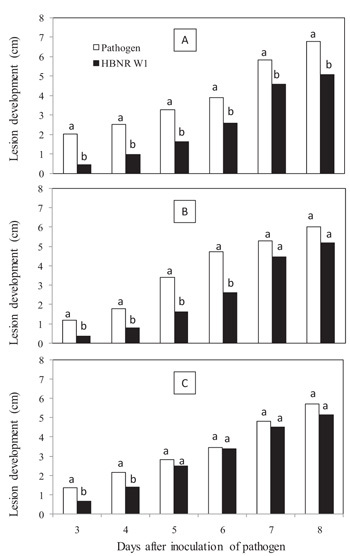 Effect of culture filtrates of HBNR isolates on lesion development of Fusarium crown and root rot of tomato after challenge-inoculation with FORL at 0 cm (A), 3 cm (B), and 6 cm (C) away from the position of HBNR inoculum. Data are means ± SEM of 4 replications with 5 seedlings per replication. Fig. (5). Effect of living mycelia of HBNR isolates covered with polycarbonate membrane filter (0.2-μm mesh) on lesion development of Fusarium crown and root rot of tomato after challenge-inoculation with FORL at 0 cm (A), 3 cm (B), and 6 cm (C) away from the position of HBNR inoculum. Bars pathogen and HBNR W1 labelled with different letter are significantly different at P<0.05 according to Fisher’s least significant difference test. Many reports demonstrated that mycelia or CF of fungi were effective in inducing resistance against various diseases [19-22] which further demonstrated that tomato plants treated with oligandrin, the elicitin-like protein produced by the mycoparasite Pythium oligandrum, showed significant induction of systemic resistance against FORL. The most striking features of the resistance mechanism involved restriction of fungal growth to the outer root tissues, a decrease in pathogen viability, and formation of aggregated deposits, which often accumulated at the surface of invading hyphae. In addition , reported that cucumber seedlings treated with pectinases extracted from fermentation products of Penicillium oxalicum BZH-2002 induced resistance against scab caused by Cladosporium cucumerinum. Various bioassays for screening biocontrol agents use soil systems [9, 11, 24], and other bioassays for induced resistance in tomato plants have been reported, such as split root, benomyl, cutting, and layering . However, these systems, like most other biocontrol assay, often require more than one month to complete. Such long-term bioassays are difficult to use in large screening trials. In contrast, the bioassay used in this study offers the advantage of a short assay period (12-18 days) and requires only a small amount of space in a clean room to test many different strains or isolates. Another advantage of this assay was its simplicity and the need for only small amounts of biocontrol agent and pathogen inoculum. By screening strains initially on plants, as opposed to pathogen-inhibition assays in Petri dishes, we hope to minimize the erroneous selection of strains on the basis of biological control traits that would not be expressed in more complex ecosystems. The results presented in this study establish that this rapid bioassay can also be effective to screen large numbers of microorganisms as biocontrol agents and plant resistance inducers. We expect that the bioassay used in this study could also be used as a rapid assay in pathogenicity testing of FCRR. The laboratory assay developed in this study could rapidly be determined as biocontrol efficacy of HBNR against FCRR within 12-18 days from seedling emergence. Except for isolate L2, all isolates exhibited a strong and consistent biocontrol efficacy. Living mycelia were the most effectively used as a biocontrol inoculum, followed by CF, and dead mycelia. We thank the Ministry of Education, Science, Sports, and Culture (Monbukagakusho) Japan, for financial assistance. Szczechura W, Staniaszek M, Habdas H. Fusarium oxysporum f.sp. radicis-lycopersici -the cause of fusarium crown and root rot in tomato cultivation. J Plant Prot Res 2013; 53(2): 172-5. Yamamoto I, Komada H, Kuniyasu K, Saito M, Ezuka A. A new race of Fusarium oxysporum f.sp. lycopersici inducing root rot of tomato. Proc Kansai Pl Protect Soc 1974; 16: 17-29. Ozbay N, Newman SE. Fusarium crown and root rot of tomato and control methods. Plant Pathol 2004; 3(1): 9-18. Mc Govern RJ. Management of tomato diseases caused by Fusarium oxysporum. Crop Prot 2015; 73: 78-92. Vitale A, Rocco M, Arena S, et al. Tomato susceptibility to Fusarium crown and root rot: Effect of grafting combination and proteomic analysis of tolerance expression in the rootstock. Plant Physiol Biochem 2014; 83: 207-16. Horinouchi H, Katsuyama N, Taguchi Y, Hyakumachi M. Control of Fusarium crown and root rot of tomato in a soil system by combination of a plant growth-promoting fungus, Fusarium equiseti, and biodegradable pots. Crop Prot 2008; 27(3-5): 859-64. Khan FU, Nelson BD, Helms TC. Greenhouse evaluation of binucleate Rhizoctonia for control of R. solani in soybean. Plant Dis 2005; 89(4): 373-9. Burns JL, Benson DM. Biocontrol of damping-off of Catharanthus roseus caused by Pythium ultimum with Trichoderma virens and binucleate Rhizoctonia fungi. Plant Dis 2000; 84(6): 644-8. Muslim A, Horinouchi H, Hyakumachi M. Suppression of Fusarium wilt of spinach with hypovirulent binucleate Rhizoctonia. J Gen Plant Pathol 2003; 69(2): 143-50. Muslim A, Horinouchi H, Hyakumachi M. Control of Fusarium crown and root rot of tomato with hypovirulent binucleate Rhizioctonia in soil and rock wool systems. Plant Dis 2003; 87(6): 739-47. Xue L, Charest PM, Jabaji-Hare SH. Systemic induction of peroxidases, 1,3-β-glucanases, chitinases, and resistance in bean plants by binucleate Rhizoctonia species. Phytopathology 1998; 88(4): 359-65. Jabaji-Hare S, Neate SM. Nonpathogenic binucleate Rhizoctonia spp. and benzothiadiazole protect cotton seedlings against Rhizoctonia damping-off and Alternaria leaf spot in cotton. Phytopathology 2005; 95(9): 1030-6. Pliego C, Ramos C, de Vicente A, Cazorla FM. Screening for candidate bacterial biocontrol agents against soilborne fungal plant pathogens. Plant Soil 2011; 340(1-2): 505-20. Karimi K, Amini J, Harighi B, Bahramnejad B. Evaluation of biocontrol potential of Pseudomonas and Bacillus spp. against Fusarium wilt of chickpea. Aust J Crop Sci 2012; 6(4): 695-703. Sharon M, Freeman S, Sneh B. Assessment of resistance pathways induced in Arabidopsis thaliana by hypovirulent Rhizoctonia spp. isolates. Phytopathology 2011; 101(7): 828-38. Cardoso JE, Echandi E. Nature of protection of bean seedlings from Rhizoctonia root rot by a binucleate Rhizoctonia-like fungus. Phytopathology 1987; 77(11): 1548-51. Sneh B, Ichielevich-Auster M, Shomer I. Comparative anatomy of colonization of cotton hypocotyls and roots by virulent and hypovirulent isolates of Rhizoctonia solani. Can J Bot 1989; 67(7): 2142-9. Koike N, Hyakumachi M, Kageyama K, Tsuyumu S, Doke N. Induction of systemic resistance in cucumber against several diseases by plant growth-promoting fungi: Lignification and superoxide generation. Eur J Plant Pathol 2001; 107(5): 523-33. Hossain MM, Sultana G, Kubota M, Koyama H, Hyakumachi M. Systemic resistance to bacterial leaf speck pathogen in Arabidopsis thaliana induced by the culture filtrate of a plant growth promoting fungus (PGPF) Phoma sp. GS8-1. J Gen Plant Pathol 2008; 74(213): 213-21. Troncoso-Rojas R, Sánchez-Estrada A, Carvallo T, et al. A fungal elicitor enhances the resistance of tomato fruit to Fusarium oxysporum infection by activating the phenylpropanoid metabolic pathway. Phytoparasitica 2013; 41(2): 133-42. Benhamou N, Bélanger RR, Reyand P, Tirilly Y. Oligandrin, the elicitin-like protein produced by the mycoparasite Pythium oligandrum, induces systemic resistance to Fusarium crown and root rot in tomato plants. Plant Physiol Biochem 2001; 39(7-8): 681-98. Peng X, Zhang H, Bai Z, Li B. Induced resistance to Cladosporium cucumerinum in cucumber by pectinases extracted from Penicillium oxalicum. Phytoparasitica 2004; 32: 377-87. De Cal A, Pascual S, Melgarejo P. Biological control of Fusarium oxysporum f.sp. lycopersici. Plant Pathol 1995; 44(5): 909-17. Fuchs J-G, Moenne-Loccoz Y, Defago G. Nonpathogenic Fusarium oxysporum strain Fo47 induces resistance to Fusarium wilt in tomato. Plant Dis 1997; 81(5): 492-6.